However comprehensive your restaurant employee training curriculum is, new hires can't master it all at once! Even the most brilliant of waiters and chefs will need time to study new policies and sharpen their skills in areas like culinary arts and front of the house service standards. This is where microlearning comes in. Microlearning is the presentation of information in bite-size amounts as part of ongoing learning. The concept is similar to the segmenting principle developed by educational psychologist Richard E. Mayor. The scholar established that it's a lot easier for learners to understand complex concepts introduced as small chunks of information, step by step. Videos for bit-by-bit restaurant training should be short and concise, maybe 2-5 minute long. You may provide these as just-in-time performance support tools (PSTs) to guide your staff briefly within their official workflows. Usually, the videos include information nuggets, and they may supplement your formal training program to help impart technical skills. Button clicks: They provide a way for the learner to submit a response. Drag and drop: The feature lets the learner draw logical relationships between two or more elements. For example, a quiz video may require the learner to drag the correct table service method (plate, cart, or platter) and drop it to the image with a matching description. Technical manuals: These may cover aspects like special cuisine recipes, front-desk etiquette, or cooking methods. Gamification: To keep the learner focused and on track, you may gamify the experience. As such, the learner has to attain a specific number of points before "promotion" to the next level. There's a reward for viewing content as well as solving challenges. While at it, a virtual expert is providing tips for overcoming the hurdles. Storytelling is an effective way to keep the learner engaged until the end of the training material. Its practical applications include menu or product knowledge training—areas that impact guest satisfaction directly. Content delivery may be in the form of parallax-based video scrolling. It includes infographic-style, engaging visuals, and a narrative that encourages the learner to keep scrolling while learning. 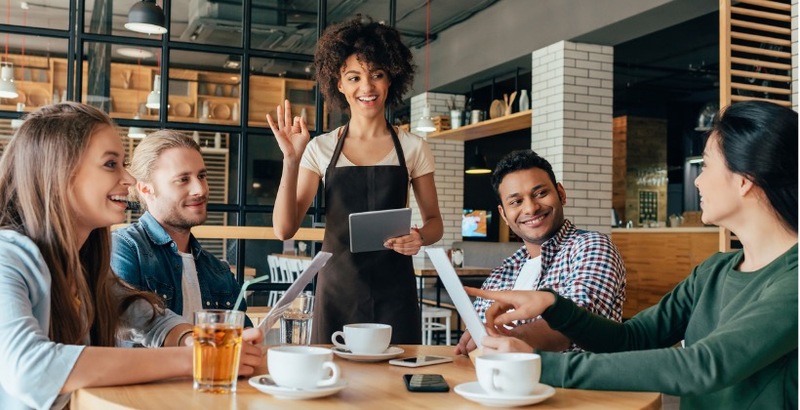 If you haven't added microlearning to your mobile LMS, you're missing out on a great opportunity to provide effective continuous learning programs to your restaurant employees. The technique allows you to break your training plan into bite-size chunks of information for your staff to absorb on the go, on the job, or at home, on an ongoing basis. Well-trained restaurant employees are vital to scaling your business as well as keeping the right corporate image. Feel free to review our digital guide, "How to Maintain Brand Consistency While Growing Your Restaurant."